The exterior, as shown from the Courtyard. Excitement Central is the first world in Wario World. Since this is the first area the player visits, it is a tutorial for items and moves. 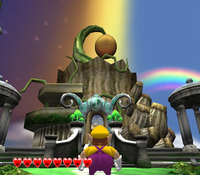 The first level, Greenhorn Forest can be accessed by a giant tree stump in the middle of the area, while the second stage, Greenhorn Ruins is located in a temple entrance to the left. Excitement Central was created as a result of the black jewel's powerful dark magic. 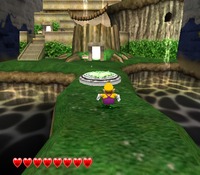 To access it, Wario must enter a large door in a forest-like area of Treasure Square. Excitement Central is set in a dense forest with tall trees and wooden bridges over lakes and waterfalls, as well as a temple. Once the two stages are beaten, Wario can fight DinoMighty and recover the first Huge Treasure Chest Key. There are mushroom symbols on each end of the gate. This page was last edited on February 5, 2019, at 11:43.